2018 repress. 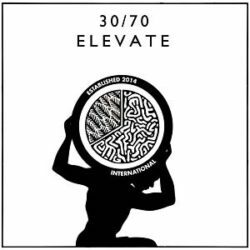 Working closely with Paul Bender of Hiatus Kaiyote and Jamil Zacharia, 30/70 produce their new record, Elevate. Elevate is a sublime statement; at once a cry for help and a call to arms, it balances delicate poetry and potent aggression with ease, all of this done with a beguiling pop sensibility. This collection of songs, their second studio effort after their debut, Cold Radish Coma (2015), is set to elevate 30/70 to the international stage. 30/70 is a cosmic mélange of boom-bap dynamics, neo-soul harmonies and jazz-funk licks, all steeped in a deep spiritual tradition, reaching from Alice Coltrane to Kamasi Washington. Melbourne’s relative isolation could in fact be a blessing in disguise; it’s resulted in a pressure cooker of talent; a tight-knit, well-practiced network of musicians and 30/70 are leading the pack. The band came of age in the wake of Melbourne’s soul scene hitting global success, a local phenomenon which shone a light on the Northside community and paved the way for a new generation of bands to take this sound and make it their own. Lovingly referred to as a community rather than a band, 30/70 is, at its core, a quintet made up of Allysha Joy, Ziggy Zeitgeist, Horatio Luna, Thhomas, and Chaser, swelling to a nine-piece ensemble when the music calls for it. Forever delivering their signature hypnotic groove, 30/70 are ready to take their message from Northcote to the world.